8 miles / 4 hours. Reeth, Swing Bridge, Grinton, Marrick Priory, Marrick, Fremington Egde and the White House. Fremington Edge rises sheer above the confluence of Arkengarthdale and Swaledale, a vast wall of screes and crags that affords a superb view of Reeth far below. 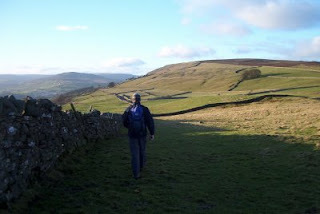 The walk across the top of the broad ridge is one of the finest in the Dales, and if you combine it with a riverside walk from the Swing Bridge, through Grinton to the historic remains of Marrick Priory, then you will be rewarded with a memorable walk. 12.5 miles / 6 hours. Bowlees, High Force, Cronkley Fell, Upper Teedale, Raven Crag, Forest-in-Teesdale, Dirt Pit. The upper reaches of Teesdale stand as England's last wilderness, a vast landscape of open fells, moors and sweeping valleys. Here you will find the Teesdale Assemblage, a unique and rare collection of arctic-alpine plants that have survived since the last Ice Age. The path across Cronkley Fell is known as the Green Trod, an ancient cattle drove road across the fells from Teesdale to Dufton. 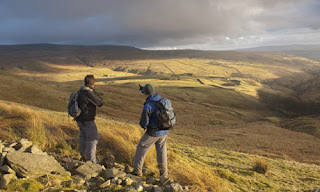 The views are superb, including this photo of the start of the descent down into Upper Teesdale. Mark Reid's 'Inn Way... to the Yorkshire Dales' was a 2-page travel feature in The Guardian on Saturday 11th April 2009.